We found a Leo-approved apartment that is large-breed friendly and are moving in this weekend. We already know Leo is going to love it because of the fenced-in dog park that’s 30 feet from our front door, but we also know he’s going to stress out and get upset from all of the changes since he’s spent most of his life living in our current apartment. Leo can already tell something is going on but just can’t put a paw on it. For the past couple of weeks, we’ve been slowly preparing for our move by throwing out or donating items and Leo didn’t bat an eye. It wasn’t until this week when we brought out our trusty suitcases, made up boxes and started packing away things we didn’t immediately need between then and after we finished moving. Unless it’s all in my head, I think Leo has been slightly stressing out about the commotion happening in our apartment. He pants a lot and paces until we settle down for the night. He was especially upset when I packed away my endless collection of shoes that he couldn’t sniff anymore. For the most part, we’ve kept Leo’s routine the same: he gets fed at the same times, goes to work with me, and goes to bed at the same time. This weekend, however, his routine will definitely change. In order to get him comfortable with the new place, we’re planning on bringing him over with his toys for the days leading up to us moving our big furniture. During those days I want to get him as comfortable with the new place as possible. I’m hoping feeding him his dinner and walking him there will help significantly because, by the end of the weekend, we’ll be there full-time. I’ll let you all know next week on how our move with Leo went and how he’s handling the new place. Wish us luck!! ← Can dogs eat eggs? Raw or cooked? And should I worry about salmonella? Leo probably thinks you are going away and leaving him. 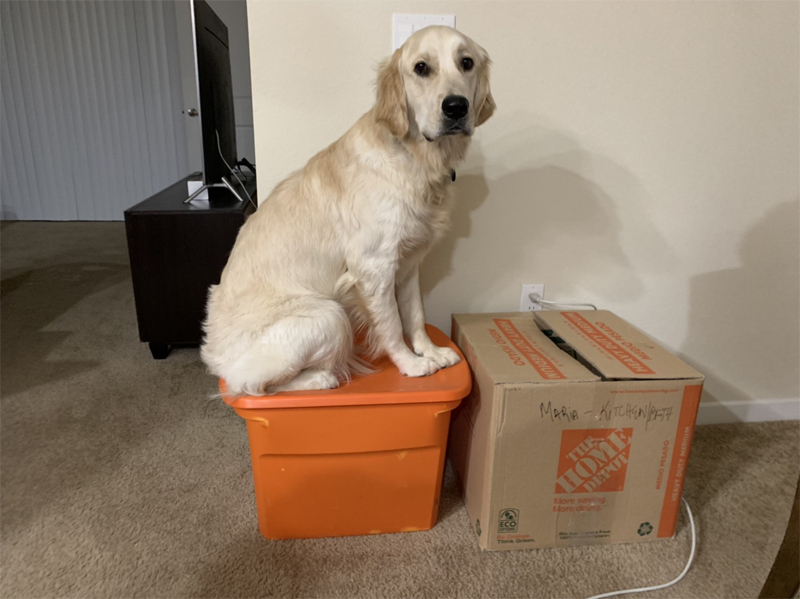 moving can be very unsettling for some dogs. i know with older dogs many have been so upset they passed away. i am so glad you found a great place with a dog park close by. you are doing right by moving slowly and letting him get accustomed to the big transition. he might have some accidents in the new place but i hope not. maybe you can teach Leo how to pack up all of his toys and help. good luck in the move. I absolutely LOVE reading about Leo. I hope you keep all of us followers updated on his progress with the move and everything that happens in his life. He sounds absolutely lovable.